On Tuesday Director of the Consumer Financial Protection Bureau, Mick Mulvaney, gave a group of banking industry executives what he felt to be sage advice on dealing with lawmakers - give them money. Before a conference of the American Bankers Association, the conservative former Congressman from South Carolina, who also heads up the White House budget office, actually advocated that lobbyists' up their contributions to Members of Congresss to influence their decisions. Mulvaney has served as "interim" Director of CFPB for the last five months, which is charged with investigating and overseeing the financial industry. Instead, he has significantly curtailed the actions of the CFPB as an independent consumer watchdog agency, which is funded by the Federal Reserve, and advocated for its placement under Congressional appropriations - and the influence of those who lobby Congress. The advice from Mulvaney, who has not only dropped most of the agency's cases against payday lenders, but has failed to enforce even a single case of consumer protection in his position, is shocking -- even for the Trump Administration. It also leads to the question, What is a Lobbyist? Professional lobbyists are people whose business is trying to influence legislation, regulation, or other government decisions, actions, or policies on behalf of a group or individual who hires them. The term "lobbying" originated in the United Kingdom when Members of Parliament gathered in the hallways or "lobbies" of the UK Houses of Parliament before and after parliamentary debates to meet with their constituents and members of the public. 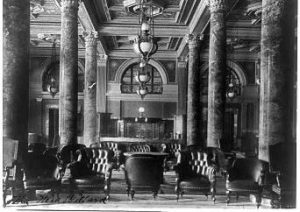 The influence of lobbyists rose in the mid-twentieth century with the creation of Political Action Committees, legally designated accounts which donate to current elected officials, campaigns, ballot initiatives, and for or against certain legislation or issues. This also contributed to the often negative perception of lobbyists as tied to financial contributions and persuasion of elected officials to the side of their cause. In the last few decades laws, like the Lobbying Disclosure act of 1995, have been enacted to regulate the activity of lobbyists, including registration as agents on behalf of their clients, and reporting of expenditures. There are also currently more than 50 versions of lobbying laws in the US states and territories. Today the scope and sophistication of the profession, and those who lobby on behalf of outside interests, has expanded significantly to include governments, corporations, non-profits, universities, unions, churches, charities, advocacy organizations and even volunteer professionals. Lobbying of the government by individuals, groups, and corporations, as ruled in various decisions by the US Supreme Court, is protected by the right to petition under the US Constitution's First Amendment's right of free speech. The number of actual working lobbyists in the US is close to 100,000 and the industry brings in an estimated $9 billion annually for its representatives. 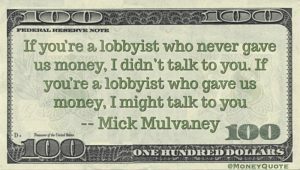 Despite the expanded representation to include issues and legislation of importance to everyday Americans, the lobbyist remains a controversial figure in our political system and, for some like Mulvaney, a valuable one. Regardless of the ethics. On November 8th over 80% percent of the nation’s 7,383 legislative seats were up in 86 of the country’s 99 legislative chambers.